Part of the impetus for the project came from the observation that, while traditional floating islands have positive features, over time they can become a bit of a liability. 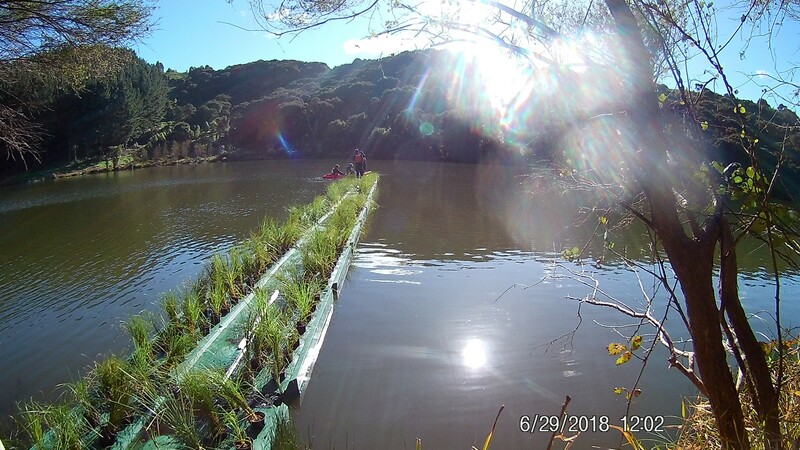 Their maintenance and disposal are problematic, as the roots of the plants grow into the shredded plastic matrix that makes up the body of the raft. Weeds tend to get a foothold and plants typically become less effective at reducing nutrients when fully mature. 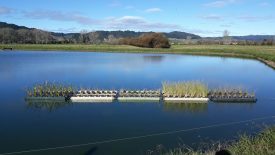 Another factor driving development of the new concept is New Zealand’s national commitment to riparian planting and wetland restoration; this technology can produce suitable plants for restoration work. As well, operational expenses should be less than those for floating islands because access is easier and the sale of harvested plants can offset costs. There can also be opportunities for community involvement in harvesting the plants and restocking the pontoons, along with planting out the mature plants. A rotation mold for the new technology has been commissioned with an initial run of forty modules. The polymer used is high grade UV-stable polyethylene similar to water tanks, which does not granulate over time and can be fully recycled. Modules can be deployed individually or in a “daisy-chain” bolted together with conveyor-belt rubber; each unit can take the weight of two people and the plants. Plants remain in individual pots and are easily harvested by walking down the central walkway. The entire string can also be hauled out onto the bank by hand or with a utility vehicle. The project is now in its second phase with two pilot projects being monitored for plant performance, structural integrity and operational issues. Engineers, ecologists and experts from other fields note that the technology may have additional benefits and other potential uses. For example, in addition to their primary function, the structures could provide wave attenuation or protected areas for swimming and kayaking. The modules could also be used to raise food crops like watercress.